Bryophytes (liverworts, mosses, and hornworts) are non-vascular plants that appeared on earth over 450 million years ago. 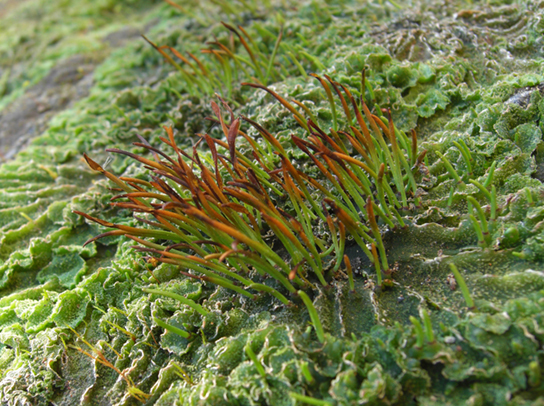 Bryophytes are the closest-living relative of early terrestrial plants; liverworts were the first Bryophytes, probably appearing during the Ordovician period. Bryophytes fossil formation is improbable since they do not possess lignin. Bryophytes thrive in mostly-damp habitats; however, some species can live in deserts while others can inhabit hostile environments such as the tundra. Bryophytes are nonvascular because they do not have tracheids; instead, water and nutrients circulate inside specialized conducting cells. In a bryophyte, all the vegetative organs belong to the gametophyte, which is the dominant and most familiar form; the sporophyte appears for only a short period. The sporophyte is dependent on the gametophyte and remains permanently attached to it in order to gain nutrition and protection. Bryophytes are the group of seedles plants that are the closest-extant relative of early terrestrial plants. The first bryophytes (liverworts) probably appeared in the Ordovician period, about 450 million years ago. However, because they lack of lignin and other resistant structures, bryophyte fossil formation is improbable and the fossil record is poor. Some spores protected by sporopollenin have survived and are attributed to early bryophytes. By the Silurian period, however, vascular plants had spread through the continents. This compelling fact is used as evidence that non-vascular plants must have preceded the Silurian period. More than 25,000 species of bryophytes thrive in mostly-damp habitats, although some live in deserts. They constitute the major flora of inhospitable environments like the tundra where their small size and tolerance to desiccation offer distinct advantages. They generally lack lignin and do not have actual tracheids (xylem cells specialized for water conduction). Rather, water and nutrients circulate inside specialized conducting cells. Although the term non-tracheophyte is more accurate, bryophytes are commonly called non-vascular plants. In a bryophyte, all the conspicuous vegetative organs, including the photosynthetic leaf-like structures, the thallus, stem, and the rhizoid that anchors the plant to its substrate, belong to the haploid organism, or gametophyte. The sporophyte is barely noticeable. Thus, the gametophyte is the dominant and most familiar form; the sporophyte appears for only a short period. The gametes formed by bryophytes swim with a flagellum. The sporangium, the multicellular sexual reproductive structure, is present in bryophytes and absent in the majority of algae. The sporophyte embryo also remains attached to the parent plant, which protects and nourishes it. This is a characteristic of land plants. The bryophytes are divided into three phyla: the liverworts (Hepaticophyta), the hornworts (Anthocerotophyta), and the mosses (true Bryophyta). Moss: Mosses (true bryophyta) are one of the three kinds of bryophytes (along with liverworts and hornworts). This image shows a moss growing on a dry stone wall. Liverworts and hornworts are both bryophytes, but aspects of their structures and development are different. The leaves of liverworts are lobate green structures similar to the lobes of the liver, while hornworts have narrow, pipe-like structures. The gametophyte stage is the dominant stage in both liverworts and hornworts; however, liverwort sporophytes do not contain stomata, while hornwort sporophytes do. 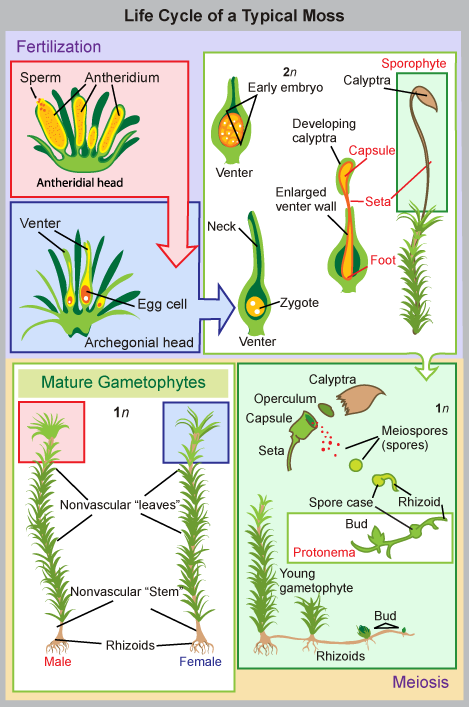 The life cycle of liverworts and hornworts follows alternation of generations: spores germinate into gametophytes, the zygote develops into a sporophyte that releases spores, and then spores produce new gametophytes. Liverworts develop short, small sporophytes, whereas hornworts develop long, slender sporophytes. To aid in spore dispersal, liverworts utilize elaters, whereas hornworts utilize pseudoelaters. Liverworts and hornworts can reproduce asexually through the fragmentation of leaves into gemmae that disperse and develop into gametophytes. Liverworts (Hepaticophyta) are viewed as the plants most closely related to the ancestor that moved to land. Liverworts have colonized every terrestrial habitat on earth and diversified to more than 7000 existing species. Liverwort gametophytes (the dominant stage of the life cycle) form lobate green structures. The shape of these leaves are similar to the lobes of the liver; hence, providing the origin of the name given to the phylum. Openings that allow the movement of gases may be observed in liverworts. However, these are not stomata because they do not actively open and close. The plant takes up water over its entire surface and has no cuticle to prevent desiccation. 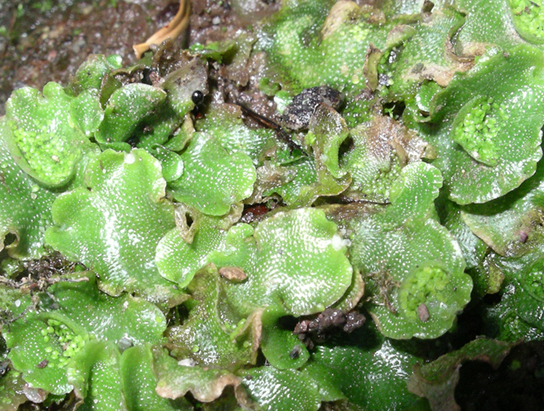 Liverworts: A liverwort, Lunularia cruciata, displays its lobate, flat thallus. The organism in the photograph is in the dominant gametophyte stage. The liverwort’s life cycle begins with the release of haploid spores from the sporangium that developed on the sporophyte. Spores disseminated by wind or water germinate into flattened thalli gametophytes attached to the substrate by thin, single-celled filaments. Male and female gametangia develop on separate, individual plants. Once released, male gametes swim with the aid of their flagella to the female gametangium (the archegonium), and fertilization ensues. The zygote grows into a small sporophyte still attached to the parent gametophyte and develops spore-producing cells and elaters. The spore-producing cells undergo meiosis to form spores, which disperse (with the help of elaters), giving rise to new gametophytes. Thus, the life cycle of liverworts follows the pattern of alternation of generations. Liverwort Life Cycle: The life cycle of a typical liverwort follows the pattern of alternation of generations. Spores are released from sporophytes and form the gametophyte. Male gametes fertilize female gametes to form a zygote, which grows into a sporophyte. This sporophyte disperses spores with the help of elaters; the process begins again. Liverwort plants can also reproduce asexually by the breaking of branches or the spreading of leaf fragments called gemmae. In this latter type of reproduction, the gemmae (small, intact, complete pieces of plant that are produced in a cup on the surface of the thallus ) are splashed out of the cup by raindrops. The gemmae then land nearby and develop into gametophytes. The hornworts (Anthocerotophyta) belong to the broad bryophyte group that have colonized a variety of habitats on land, although they are never far from a source of moisture. The short, blue-green gametophyte is the dominant phase of the lifecycle of a hornwort. The narrow, pipe-like sporophyte is the defining characteristic of the group. The sporophytes emerge from the parent gametophyte and continue to grow throughout the life of the plant. Stomata appear in the hornworts and are abundant on the sporophyte. Photosynthetic cells in the thallus contain a single chloroplast. Meristem cells at the base of the plant keep dividing and adding to its height. Many hornworts establish symbiotic relationships with cyanobacteria that fix nitrogen from the environment. Hornworts: Unlike liverworts, hornworts grow a tall and slender sporophyte. The life cycle of hornworts also follows the general pattern of alternation of generations and has a similar life cycle to liverworts. The gametophytes grow as flat thalli on the soil with embedded gametangia. Flagellated sperm swim to the archegonia and fertilize eggs. However, unlike liverworts, the zygote develops into a long and slender sporophyte that eventually splits open, releasing spores. Additionally, thin cells called pseudoelaters surround the spores and help propel them further in the environment. Unlike the elaters observed in liverworts, the hornwort pseudoelaters are single-celled structures. The haploid spores germinate and produce the next generation of gametophytes. Like liverworts, some hornworts may also produce asexually through fragmentation. Life Cycle of Hornworts: The life cycle of hornworts is similar to that of liverworts. Both follow the pattern of alternation of generations. However, liverworts develop a small sporophyte, whereas hornworts develop a long, slender sporophyte. Liverworts also disperse their spores with the help of elaters, while hornworts utilize pseudoelaters to aid in spore dispersal. Mosses are bryophytes that live in many environments and are characterized by their short flat leaves, root-like rhizoids, and peristomes. Mosses slow down erosion, store moisture and soil nutrients, and provide shelter for small animals and food for larger herbivores. Mosses have green, flat structures that resemble true leaves, which absorb water and nutrients; some mosses have small branches. Mosses have traits that are adaptations to dry land, such as stomata present on the stems of the sporophyte. Mosses are anchored to the substrate by rhizoids, which originate from the base of the gametophyte. The moss life cycle follows the pattern of alternation of generations where gametophytes form male and female gametophores, which fertilize to form the sporophyte; spores are released from the sporophyte to produce new gametophytes. The concentric tissue around the mouth of the capsule is made of triangular, close-fitting units that open and close to release spores, and the peristome increases the spread of spores after the tip of the capsule falls off at dispersal. More than 10,000 species of mosses have been cataloged. Their habitats vary from the tundra, where they are the main vegetation, to the understory of tropical forests. In the tundra, the mosses’ shallow rhizoids allow them to fasten to a substrate without penetrating the frozen soil. Mosses slow down erosion, store moisture and soil nutrients, and provide shelter for small animals as well as food for larger herbivores, such as the musk ox. Mosses are very sensitive to air pollution and are used to monitor air quality. They are also sensitive to copper salts. Such salts are a common ingredient of compounds marketed to eliminate mosses from lawns. Mosses form diminutive gametophytes, which are the dominant phase of the life cycle. Green, flat structures resembling true leaves, but lacking vascular tissue are attached in a spiral to a central stalk or seta. The plants absorb water and nutrients directly through these leaf-like structures. The seta (plural, setae) contains tubular cells that transfer nutrients from the base of the sporophyte (the foot) to the sporangium. Some mosses have small branches. Some primitive traits of green algae, such as flagellated sperm, are still present in mosses that are dependent on water for reproduction. Other features of mosses are adaptations to dry land. For example, stomata are present on the stems of the sporophyte and a primitive vascular system runs up the sporophyte’s stalk. Additionally, mosses are anchored to the substrate, whether it is soil, rock, or roof tiles, by multicellular rhizoids. These structures are precursors of roots. They originate from the base of the gametophyte, but are not the major route for the absorption of water and minerals. The lack of a true root system explains why it is so easy to rip moss mats from a tree trunk. 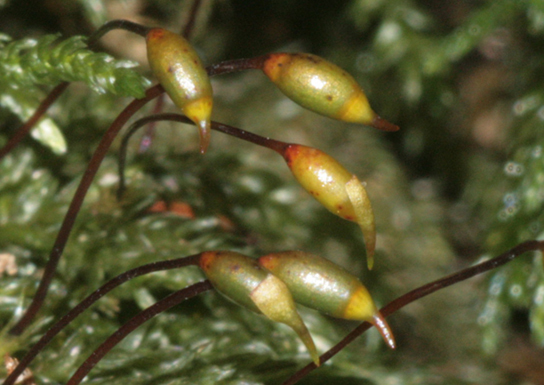 Setae: This photograph shows the long slender stems, called setae, connected to capsules of the moss Thamnobryum alopecurum. The moss life cycle follows the pattern of alternation of generations. The most familiar structure is the haploid gametophyte, which germinates from a haploid spore and forms first a protonema: usually, a tangle of single-celled filaments that hug the ground. 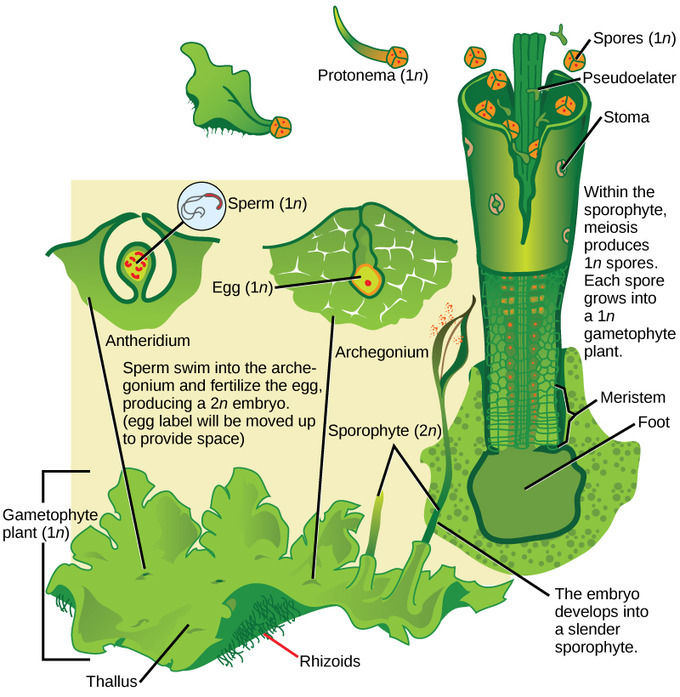 Cells akin to an apical meristem actively divide and give rise to a gametophore, consisting of a photosynthetic stem and foliage-like structures. Rhizoids form at the base of the gametophore. Gametangia of both sexes develop on separate gametophores. The male organ (the antheridium) produces many sperm, whereas the archegonium (the female organ) forms a single egg. At fertilization, the sperm swims down the neck to the venter and unites with the egg inside the archegonium. The zygote, protected by the archegonium, divides and grows into a sporophyte, still attached by its foot to the gametophyte. Life cycle of mosses: The alternation of generations cycle begins when the gametophyte germinates from a haploid spore and forms a protonema. Apical meristem-like cells divide and give rise to the gametophores. 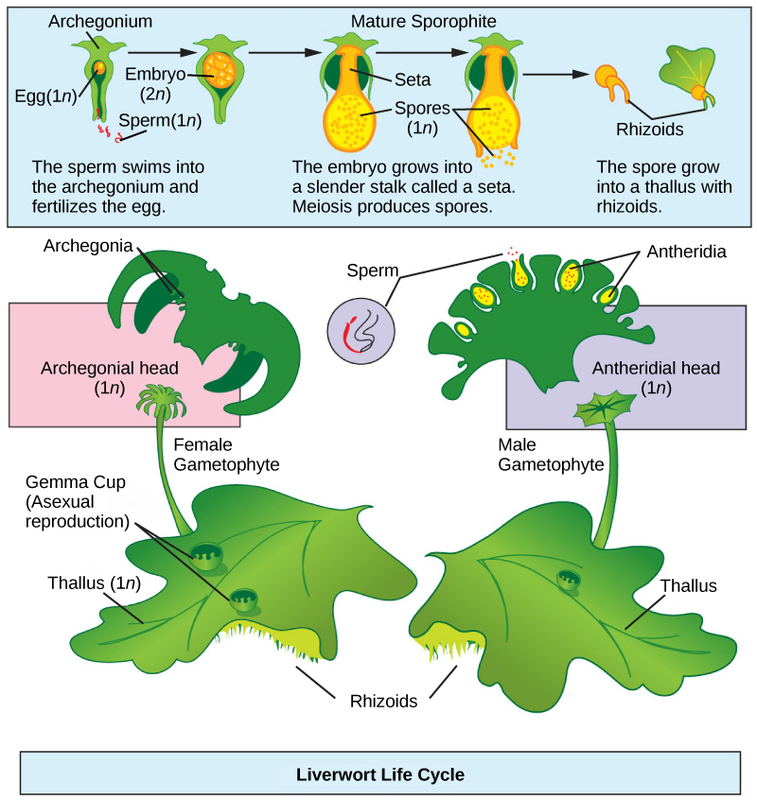 The archegonium (female organ) and antheridium (male organ) develop on separate gametophores. After fertilization, the zygote divides and grows into a sporophyte, which stays attached to the gametophyte. Spores released from the sporophyte germinate and produce gametophytes; the process begins again. A structure called a peristome increases the spread of spores after the tip of the capsule falls off at dispersal. The concentric tissue around the mouth of the capsule is made of triangular, close-fitting units, a little like “teeth”; these open and close depending on moisture levels, periodically releasing spores.